What Are Jewels After All? Ever wondered why jewelry has played such an important role throughout history? Well, adornment has generally defined not only beauty enhancement, but also the social, religious or cultural status of the wearer. In particular cases, jewelry confirms one’s economic status, especially if the worn items are rare or remarkably expensive. In the past decades, accessories have increased their value of cultural and social identification items, as they pretty much throw a signal about the adherence to a trend, community or lifestyle. Yes, there’s only so much a bead can mean! Brooches, earrings, bracelets, rings, necklaces, military decorations, and many other types of jewelry have played essential roles in the history of mankind as far as it is known. Ever since the primitive humans have left their mark on Earth, there have been discovered ways and styles through which they chose to beautify their looks by wearing some sorts of accessories, as well as underline their social ranking. For a certain point further, metal and uncut gemstones have been carefully combined to deliver precious little shiny possessions, known today as jewelry. Although the basic forms of adornment may vary according to cultures and geographical setting, as well as the geological availability for particular loose gems, but they usually highlight a few conventionally preset areas of the body: ankles, hands, chest, head. Even if the Western culture seems to have set monopoly on this industry, historically speaking Asia has been the greatest influence in terms of style and design. Jewelry complements an individual’s personal style and often carries an emotional input, as people opt for precious gifts for their dear ones on special occasions. In some cases, particular jewels travel through time in the form of family inheritance, from son to son or daughter to daughter. What Are They Essentially Made Of? Jewelry is composed out of a wide range of materials, from nature originated elements such as shells, coral, precious metals, but also out of beads or fake gemstones. Patterns, symbols, execution, properties vary tremendously depending on the producer, the market and the fashion. Inventive designers propose accessories out of nearly anything – including recycled materials such as plastic. The Ancient Greeks collaborated to the contemporary Western classification in terms of setting a distinction between precious and semi-precious stones. As you definitely have noticed, diamonds – a girl’s best friend, to quote a famous song, rubies, sapphires and emeralds are precious stones. All other gemstones are semi-precious. The classification is based on the availability of the stone (the rarer, the more expensive or precious) and its quality. Loose stones are also classified according to their color, hardness or translucency. Although this categorization seems to also reflect the intrinsic value of the final jewel, that isn’t necessarily the case, since the terms can be quite misleading in a commercial context. If you were wondering, gemstones are the object of research, description and evaluation of professionals called gemologists, who belong to the field of gemology. But if you’re planning on creating your own handmade accessories, it’s not likely you will care too soon about the chemical composure of the stone or its crystal system. You probably care about nurturing your unique ideas for a few designs, engaging small production costs and delivering beautiful adornment. Let’s see what you need to know before you sell your first jewel. Here’s a few starting tips. Gather your tools, from wire cutters, beading wire, crimp tubes, clasp, crimping pliers to beading boards, spacers and, well, eventually, your gemstones. Beaded accessories are a good starting point for any beginner. If you’re wondering how to start, you can search the Internet for tutorials and reproduce basic jewelry until you feel prepared enough in your craft to start improvising. Don’t expect fabulous results from the first broche you’re making. If you want to make wooden accessories, make sure you can handle the crafting of the wood itself. Wood is more expensive than wire, for example, and you wouldn’t want to waste it. If it comes to metals like sterling silver or gold, you might consider sharing your production with a specialized jeweler. Once you’ve acquired your supplies, the best way to experiment is to watch and follow free websites, blogs or platforms (like Pinterest or Etsy) to research the latest trends and tricks. Reading a blog might save you some time and money which could have been wasted due to your lack of experience. Many a website offer online support for designers. If you want to become a professional in this field after trying your hand at – wink – handmade jewelry, you can look for specialized courses and internships to start training for the finest work with jewelers with years of experience. If you’re already packed with supplies at home and willing to start manufacturing jewelry, we recommend to start studying cultural imagery in regards to adornment. You might find inspiration in vintage design, in Indian, Hawaiian or Irish jewelry, in chic Swarovski stores, in American native symbols, in African heritage or custom bridal jewels. It’s normal to look back in history and observe how this preoccupation for jewels, stones and any kind of adornment started to be more and more spread. If you’re aiming to design diverse and original pieces, some background research might be ideal before actually putting your fingers to work. That doesn’t mean that you have to leave your originality aside, but as an adult you need to hone your skills when entering a new field – imagine that you would like to become a musician without having any idea about any instrument. If you’re trying to avoid stones or beads wholesale producing and work as an artisan, you need to keep in mind that a fine crystal might be cheap only if bought in a larger quantity for mass production. If you want to start selling your accessories on Ebay and deliver them from NYC to Chicago, Los Angeles and San Francisco to all over the world in places where people desire to buy your earrings or bracelets, you will have to find ways to balance your expenses in order to make a profit too. Before you consider putting yourself on the market for sale, make sure you have an attractive display for your products, ranging from a pretty box to the wrapping or your product photos. There are also differences between the way you need to identify the correct displays in the case of men’s or women’s accessories. Your pricing method also needs to be smart: not too expensive, not too cheap. Any designer will confirm that the way a product is supported by nicely wrapped boxes and good lighting in the presentation pictures can determine its price and it’s equally important to the aspect of the accessory, regardless if it’s made of clay, copper, leather, glass. You also have to carefully observe the market’s status, especially if you’re willing to make handmade, unique or custom jewels. The jewelry business might differ between Portland, San Diego, Boston, Denver, Seattle, Philadelphia or Chicago. Tourists’ hotspots like Hawaii might not be an ideal destination if you want to specialize on, let’s say, wedding adornment. There might be a higher demand for turquoise mounted on silver in particular areas of the US, there are universal jewels like pearl earrings which never go out of fashion, there are lower sales in some cities and so on and so forth. If you want to make it big, you have to start with baby steps. Make use of the huge available resources in terms of promoting your stuff, which are usually free. If you don’t want to buy hosting and create a website, start with a Facebook page and link it to a Pinterest Account. That way, people can see your products wherever they might be. Online promotion has more than once showed itself as more efficient and effective for small businesses than investing in a store or a classical business. If your jewelry demand from buyers increases, you can then consider opening up a store or a chain of stores. Sort your handmade jewelry into categories and use hashtags for a good indexing. If you design pieces for men, then you have to research this particular slice of the market and see how guys place orders, what they choose and what their budget is. Usually, a lot of retailers offer information like “Bestselling Products”, which can reveal some facts about the current buying trends. Regardless if you’re in Austin, Houston or anywhere in TX, in the US, in Canada or in Asia, there are particular trends you need to study if you are looking for recognition and success. If you’ve started your little online shop and if you’re loaded with deliveries, production and demand, you might have to consider hiring some people and organizing yourself legally and practically to develop a medium sized business. You have the option of keeping your name and independence and hire an assistant, then perhaps invest in a delivery system or open up a shop, or you might be interested in collaborating with retailers. The money maker is definitely the first option, but it also involves a larger risk than dedicating your services to a third party and checking in your bill at the end of the month. Can I Still Stand Out? Many designers ask themselves if it’s still worth their while to enter a highly competitive market and make huge efforts to place themselves on an advantageous position. Given that there are Asian markets dedicated to reproducing original models, shapes and figures for extremely low prices and in large quantities, even the most renowned jewelers as well as fashion designers or beauty companies might feel a bit uncomfortable. The truth is that any free market in capitalism has its perks as well as it has some threats, shortages, limits, or weaknesses. The lack of control in terms of competition actually reunites all these issues, but shouldn’t pose a risk if you’re determined, well oriented, resourceful when it comes to energy and selling abilities, talent and skill. Independent handmade jewelry producers have the advantage of organically penetrating communities in the context of yard sales, small fashion events or when they collaborate with other indie designers. Sealing a niche is usually the main goal you have to achieve, and then making yourself heard. Barters are also an excellent idea: if your products are wanted by popular people or even celebrities, sought after in fashion magazines or asked for particular shootings, be open and willing to collaborate. You can never know how the invisible mechanisms of networking and exposure fix you deals you could have never obtain by simply promoting posts on Facebook! Some of us are constantly searching for that one thing that would make us happy, successful and satisfied – by that we mean everything: from money to peace of mind. Even if you’re keen on starting a handmade jewelry business or production line, you might discover that you’re not good for this job or you would prefer doing something similar, but different. Don’t be disappointed if the place this path takes you isn’t the one you imagined. It might open some perspectives which can be a lot more beneficial! Plus, in the field of design, any experience is welcome, alongside developing new skills. If you keep educating your eye and fingers to produce bedazzling objects, you can expand your field of preoccupation at any time and start adding to that jewelry portfolio all sorts of stuff. Artisans rarely limit their vision to jewels nowadays, and create concept – collections instead. These might include writing accessories, agendas, notebooks, umbrellas, watches, doormats, cups and basically the list is endless. 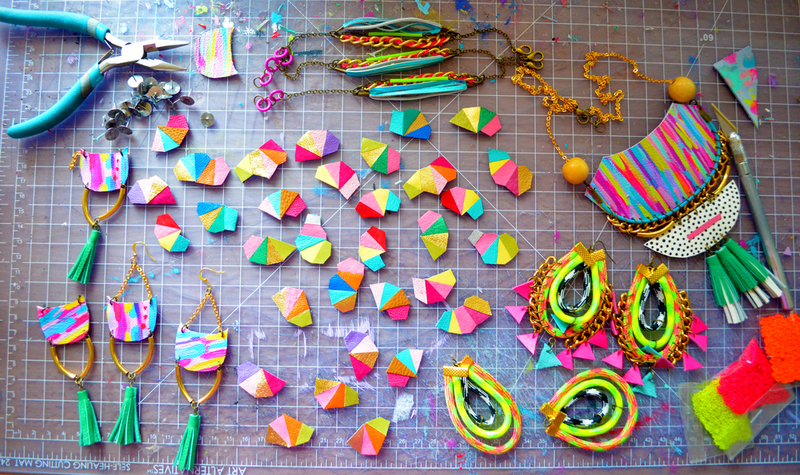 Hey Buddy!, I found this information for you: "Starting Tips to Design Handmade Jewelry". Here is the website link: https://accessgems.com/starting-tips-handmade-jewelry/. Thank you.